Based in Cheynne, Wyoming, MyLLC.com is a leading document filing service that caters to individuals, small-businesses, as well as the legal and financial industries throughout the United States and abroad. Founded in 1998, MyLLC.com® has earned our client's trust and loyalty by providing reliability, attention to detail, industry knowledge, and application of appropriate and up-to-date technology. We measure our success by our ability to obtain referrals from our clients; expand our portfolio of services; and maintain a rewarding team-oriented workplace. Honesty, fairness and respect are the basis for MyLLC.com's relationships with its clients, employees, vendors and peers. We act with integrity at all times. Our bottom line is your satisfaction, not how much we can sell you. 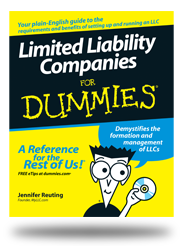 MyLLC.com, the authors of Limited Liability Companies for Dummies™ offers customers complete entity formation, entity dissolutions/withdrawals, certificates of good standing, amendments, free name checks, trademark searches and registrations, DBA registrations, registered agent services, corporate services and corporate supplies such as corporate kits, stock certificates and embossing seals. We offer these services in all 50 States as well as the District of Columbia. and become a savvy entrepreneur with your own LLC! Our book offers customers information on entity formation, entity dissolutions/withdrawals, certificates of good standing, amendments, free name checks, trademark searches and registrations, DBA registrations, registered agent services, corporate services and corporate supplies such as corporate kits, stock certificates and embossing seals.